A storm developing in southern California could make its way to the Mid-Atlantic and the rest of the Northeast this weekend. A large-scale atmospheric pattern supports another storm, yet the type of participation is still a mystery. That being said, the potential for Snowmageddon is something meteorologists will be monitoring this week because cold air will be abundant, should it form and follow a track that would affect the Northeast. 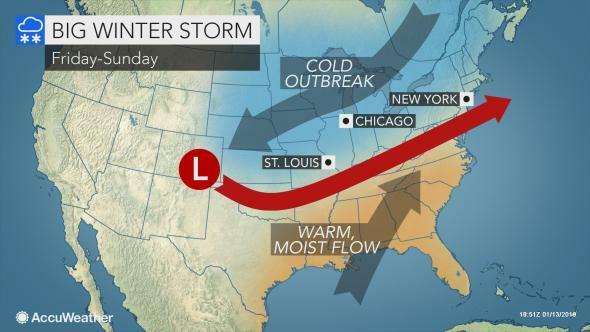 Vallee Weather Consulting meteorologist Ed Valle warned Sunday that a "very favorable pattern for snow and cold could potentially arrive next weekend and beyond." In short, Valle is convinced another winter storm is dead ahead. "The pattern across the eastern United States is in flux. We continue to see signs that as we head toward this weekend and beyond, the theoretical atmospheric stars may align to promote a colder and possibly snowier outcome for many in the East. While there remains some uncertainty as to how cold the air mass will be, an infusion of moisture from the Pacific and Gulf of Mexico should provide no shortage of moisture. The amount of cold available will ultimately dictate what precipitation type any one location sees, and is something that will be ironed out as systems get closer in time. At this juncture, all areas from the Midwest to Northeast, including the major cities, are in play for wintry mischief as we close out January," Valle said in a weather update on Monday. The European model shows much uncertainty to where the storm is exactly headed. However, 51 different forecast models all point to the possibility of wicked winter weather from now until the end of January for the Mid-Atlantic and North East regions. Vallee indicates that "interior snow chances this coming weekend - coastal areas (i.e. 95 corridors) will be track dependent." New York Metro Weather said they are "monitoring the atmospheric evolution, and the potential for snow does exist." They provide a weather model that shows the formation of the storm and how it is expected to slam in the East this weekend. Vallee correctly pointed out on Sunday, "natgas could be the greatest beneficiary of a significant cold pattern change coming to the East Coast in the second half of January into Feburary." Heating degree day (HDD), a measurement designed to quantify the demand for energy needed to heat a building, has signaled that natgas demand is likely to increase in the lower 48 over the coming week. After a near -41% collapse in natgas from November's 4.92 high, the current shift in cold and snowy weather closed natgas up +16% on Monday. Vallee shows in the next 6 to 10 days - temperatures across the country are expected to plunge. Vallee also shows the GFS model points to a very active next two weeks across the Midwest and East. New York has not had a significant snowstorm since Nov. 15, according to the National Weather Service. Boston had less than an inch so far. That may be about to change if the models are correct.